The increase in access to information brought about by social media has meant consumers are much more aware of what goes into their cosmetic products, what works and what doesn’t. This increased knowledge has put a lot of pressure on companies to be more responsible with what they use in their products and is a major driving force behind the growth in natural and organic products. It has also led to a growth in the demand for products that are tailor made for the specific needs of skin and an expectation of guaranteed results. It seems likely that within 10 years you will be able to get a precise analysis of your individual hair and skin, down to DNA level, and get custom cosmetics and toiletries produced that are unique to you. For the vast majority of people that route is likely to always be a little too expensive but new technology can come to the rescue in the form of things like phone apps that help you understand your skin better and explain the treatment options available. Such technologies are giving customers an efficient and cost-effective shopping experience and for companies it is a way to personally connect with their consumers and ultimately meet their needs. Here at Cosmiko we appreciate such technologies as they give our customers a better understanding of the type of products and formulations they would like us to produce. We also work on the basis that if the ingredients, formulas and manufacturing methods are of the highest quality they are more likely to be suited to more people. 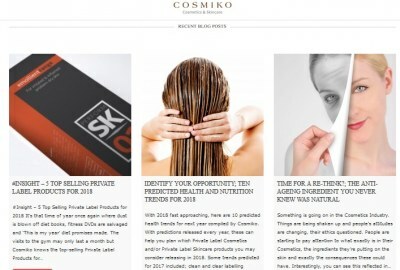 Cosmiko – Private Label Cosmetics and Skin Care Products conceived, developed and manufactured in the UK.